Steps/Mesures is a short-term residency program presented in partnership with the Institut Français and the Consulate General of France in Toronto. This program invites artists and curators living in France to Toronto between Winter 2015 and Winter 2016 to forge conversation between cultural ecologies. The next guests of the series will be artists Patrick Bernier and Olive Martin. 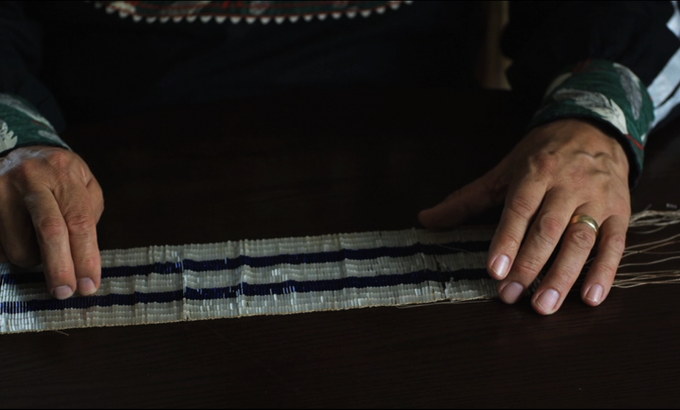 This talk will take as its starting point Bernier & Martin’s ongoing research into Wampum belts, and will lead into an open discussion. Martin and Bernier, both European artists based in Nantes, France, were first introduced to the First Nations diplomatic and cultural practice while meeting with members of the Mohawk community of Kahnawaké during a six-month stay in Montreal in 2005. They will show extracts from New Kahnawaké, a 45′ film shot on Kahnawaké territory in 2009, and share and discuss other ongoing projects shaped by these experiences and exchanges. Patrick Bernier (1971, Paris) and Olive Martin (1972, Liège) have worked collaboratively for over a decade, developing a body of work with combines: writing, performance, photography and film. Their projects deal with issues of hospitality, hosting and porousness of identity; while often working in open collaboration with storytellers, lawyers specialising in authorship and foreigner rights, an American auctioneer and a group of chess players. Selected projects by Bernier and Martin include the films: untitled: Manmuswak (2005) and New Kahnawaké (2010), an ongoing performance X. and Y vs. France, The Case for a Legal Precedent (2007-present), an activated chess variant and installationL’Echiqueté / the Checkered Chess (2012), and the site specific installation Monument à l’évasion at Salines Royales d’Arcs et Senans (2014). These works and others have been presented in numerous film festivals including: Locarno, Rotterdam, Edinburgh, Leeds, Belfort, Barcelona, Clermont-Ferrand, Angers and Douarnenez, and in contemporary art and performance spaces including; Kaaï Theater, Bruxelles; the Centre Pompidou, Paris; the Serralves Foundation, Porto; Le Quartier, Quimper; Frac Alsace, Selestat; YBCA, San Francisco; and CAPC, Bordeaux. They participated in the Belgian Pavillion’s group show titled Personne et les autres at the Venice Biennial in 2015, and presented solo shows at Le Grand Café in Saint Nazaire and at MABA, Nogent sur Marne, both in France. Bernier and Martin are currently based in Nantes, France.